Looking to get organized on a budget? Inspired by various posts and books, most notably 40 bag challenge, Organized Simplicity and the related Project Simplify, I have been going through my house, room by room, and challenging myself to really let go of everything I do not need or love. I have been coloring outside the lines – challenging myself to think of ways I can make things do double duty. Like, letting go of knick-knack type decorations and instead displaying lovely kitchen pieces that I can also use to serve meals and entertain. I have always been pretty organized – I abhor clutter and disorder – but there is always room for improvement and you sort of find things creeping into your house over the years. I have read about the possibilities that open space can bring, and the peace of having a cleaner space. I wondered if I could gain even more of that – and it turns out that I can! I have really enjoyed my virtually empty nightstand (save a clock, coaster and lamp), my newly pared down office shelving and my wonderfully spacious kitchen cupboards and drawers. The fact that I purged so much stuff brings me to point #2 first: make yourself have a garage sale. What.a.pain. I am SO not a fan of having a garage sale. In fact, I never have had one by myself. I have participated, though, and the marking, sorting, storing, then cleaning, arranging and working the sale – ugh! I am way more inclined to just donate things (if you itemize, it is a great tax write off, too). But, this year, we have a lot of things to get rid of at once, and my husband has championed the “Let’s Have a Garage Sale” movement. He has emailed our neighbors and seems to have drummed up support for a neighborhood garage sale. I have invited my friends to join in, too. Misery loves company, no? As I have been sorting, assessing, purging, marking and storing things item by item, it has become clear to me that if you go through the pain of point #2, making yourself Hold a Garage Sale, then point #1, Just Say No, is so much easier! Remind myself what I paid for that item, feel the pain of marking it 90% (or more) off for the garage sale (not to mention the time I spent shopping for it in the first place), and vow never to spend on stupid stuff again. This is probably what I do for 80% of the items. In fact, there have been recent times I considered buying an item, only to remind myself that it will probably end up in a garage sale in 2 years. Super easy to walk away after that depressing thought. Appreciate what an item has meant to me, but accept that it is time to let it go. If it is something passed down to me, I have been emailing my relatives to make sure no one else wants it before I put it in the sale. I have a special box of items, it may go in there (though very few items make it into that box) or I may take a picture to remember it by. Another alternative is to repurpose the item – could it hold flowers, or desk items, etc.? – but be honest with yourself. Your space is precious, don’t compromise just because. Wonder why I have so many (insert name of item here) and donate. Example: Why do I have four packs of 10 Bic pens? Answer: Because they were free. (Not a great answer, by the way). Donate: Church and preschool use pens all the time for filling out forms – donated. Research more expensive items (carnival glass bowl, very nice quilted china storage system) on ebay and Craig’s List – sell online for a better price than I could get at a garage sale. Get real with myself and toss true trash. Five shirts to paint in, just in case? Really? And my house is pretty much all freshly painted. Now there is only one paint shirt, just in case. Get real with myself on perfectly good stuff that I never use. I can’t recall ever making melon balls, needing six ice cream scoops at once or using that DIY repair book (from 1980, by the way – maybe it will turn out to be a collector’s item (or not)). Hope the giver of the gift does not look for the item in my house next time he or she is over next. Put on blinders. Don’t shop when you don’t have a purpose. Don’t look through the Pottery Barn catalog. You don’t need anything – including temptation. Recycle the junk mail, avoid the mall. Make a list, stick to it. Keep the list going at all times, so you can just do one trip a month or so, and not every week. A good deal = NOT a good deal if you: don’t need it, don’t have room for it and/or won’t use it. Be honest before buying – ask yourself if you already have something that can fill your perceived need. Try that first. I used to come home from a sale and say to my husband, “Look how much I saved!”. To which he would always reply, “How much would you have saved if you did not buy it at all?”. Annoyingly, it turns out that is a valid point. Take a deep breath. Don’t give in to impulse buying. Make yourself wait at least 24 hours before buying an impulse item (a.k.a. : an item not on your list). If you find yourself not using an item, pass it along. Maybe a friend can use it, donate it to a charity, etc. Don’t take things from people just because they offer it to you. If you can’t use it (or don’t want it) – thank them for the thought, but politely decline. Perhaps you know of a charity that might be able to use it – suggest they donate it there. While I still have some areas to go through (my husband and kids are ferociously guarding their spaces), I feel so much better already. I really, really do. When I have been on the fence about something, I put it in the garage sale box and tell myself I can change my mind when I get ready for the sale. You know what? I cannot even recall one of those items right now – guess I don’t need it! 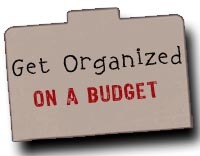 Be sure to check out our other great tips for getting organized on a budget. Thanks for the post! I try to keep my possessions to a minimum as well. One rule I have for purging is getting rid of anything that is not useful, beautiful, or meaningful. I especially love your double-duty trick! I have started decluttering, and now my family members – primarily my mother – goes looking for things she has given me years ago or asking what I did with such and such and is angry when I tell her that it was given to Goodwill or sold, etc. How do you manage those situations? I think this is the biggest barrier to me getting rid of things because that is such an uncomfortable conversation since she tends to take it as a personal insult if I don’t keep every gift I’ve ever been given…. I hear what you are saying! You might try to display it for a while, nice and prominently, then discretely move it along. You could also try talking to her – explain that you cannot keep everything, and see if she wants something back before you move it along. Just try to be gracious, but firm, and choose your battles. Good luck!